← Writing Reports: Victorian Essential Learning Standards Assessment Maps – A QUALITY LINK! 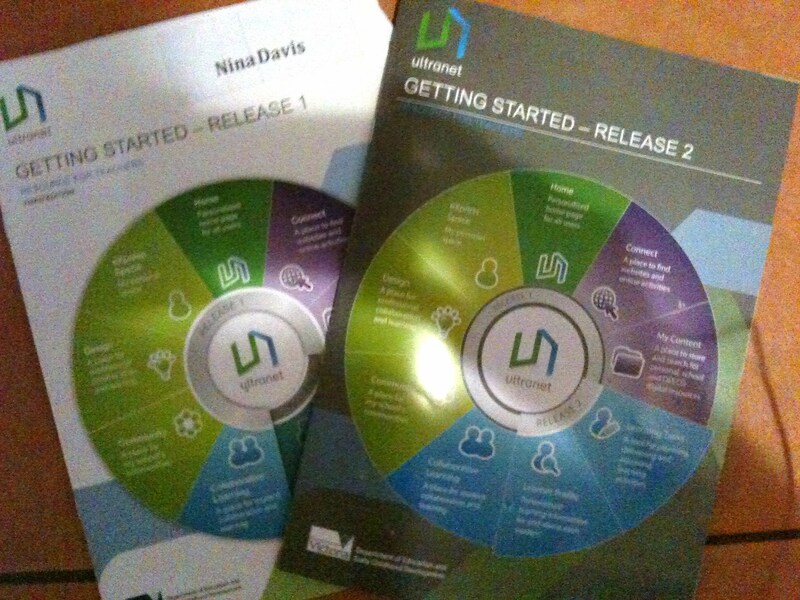 The Ultranet: Release 2- My thoughts & recommendations…. I recently attended a two day Lead User Professional Development as a Lead User to learn about Release 2. I’ve taken a few days to process my learning, and here is a brief reflection, and a couple of recommendations. On the second day, I spent the morning with one of my Prep students. The student was asked to log on to the Ultranet with their password. They then had to locate their task, complete their task, save and revisit. The timed log out was an issue as we spent longer on the task than expected. We were learning together. My student did complete the task, and I was able to review her work. This is probably when I realized the potential of the Ultranet for teaching and learning, and eventually reporting to parents. Assessment is ongoing, and I can see great value in this. I enjoy working within the Ultranet, and have recently used its features as part of the Teacher Professional Leave reviews. I’ve now spent quite a lot of time in the Design Space, joining a discussion, completing a poll and uploading a criteria reflection. I’m starting to feel more comfortable in the Release 1 Spaces. 1. Increase timed log out time for students, or have a ‘draft save option‘. If this is available, it isn’t clear. 2. Have a play space for teachers. I would feel more comfortable learning in a space where I can make mistakes as I learn. Is it possible for a teacher to become a member of their grade ( invented pupil), so they can set tasks, complete tasks, make comments and assessments… and delete? The Ultranet coaches have the option of using a practice space. This is what teachers need. Maybe someone reading this will make a recommendation on my behalf. I see this as integral to the Ultranet’s success. I agree that it would be great to have a ‘play space’. I’m both a lead user and a specialist teacher so I won’t have my ‘grades’ listed until next year and therefore cannot even test things on real students. Having the ability to put in some test students would really help. It has concerned me that what teachers put in the student/task space – comment/assessment at present is permanent & will stay with the child for their whole P-12 education. Having a dedicated play/teacher’s learning space/make-up student would provide a safety net for all. Apparently, this has been recommended in a space you can make suggestions in within the Design Space. However, a play space isn’t available – hopefully it will be soon, so teachers can really start moving forward. I really don’t think it is likely we will get pretend or play students as it means messing with school’s cases data. This is used to fund through srp – so adding fake ones would muck it all up. You can actually erase a learning item which will take all the student input and feedback with it. This makes playing with real students a bit safer. You can also delete confirmations – but I cannot be sure as yet whether this removes it from their historical data as well. So take care there when playing. Hope that’s a bit of a help. We certaininly suggest that even if the task is rubbish – that comments and confirmations need to be reasonably right for any real child – just in case you can’t get rid of them completely. We actually suggest.. “Thanks John for being our class test person for the ultranet it has really been a help to us as we learn how this all works” or something similar. There is certainly a lot for us all to learn – but slowly seems the wisest way. Tanya is one of the SMR team – so of course she’s great!!! I thought it would be a challenge. Thanks for the information, and I’ll make sure it’s passed on. One of the reasons I’m comfortable in the Design Space is that I can have my own little play space, where my learning is happening. We’ve got some good things happening at school, wikis & blogs with photos etc. People are having a go, and a school curriculum space is being developed. I would call it a ‘wall’ linking into areas etc… Certainly will improve document storage, as staff share becomes a challenge. It’s going to take time to get this embedded into teacher practice. I will visit the Enhancement Suggestions Design Space and add a few other suggestions. I do share the vision of the Ultranet, but want teachers to feel comfortable while learning. I play to learn, experiment and make changes all the time and I’d like to be able to do this. Adding myself as a student doesn’t seem impossible, but then I’m not a tech either. Firefox has definitely made navigating the Ultranet smoother. It’s going to take time to get teacher’s cruising this space, but as a teacher interested and promoting 21st Century learning, I want this to work. P.S Tanya, our Ultranet Coach is doing a great job.